The Opinionated Knitter arrived in the post yesterday and I’m thinking a Baby Surprise Jacket from this and some of this and this spun in the same way. I don’t even know any babies, but whatever, that thing is so cute. This photo hardly shows the sweater at all, but seriously. Also finished is poor poor Emily’s superwash Merino yarn. For Emily, the master of swaps. Emily sent me gorgeous tea/coffee bowls ages ago in exchange. Thanks for the lovely comments on the pulse warmers. Don’t be afraid of the gauge! I knit one per evening and did the button bands/ finishing the third. It’s not too terrible- like knitting socks. what a great way to get little bits of fiber here and there – they make a totally unique colorway! 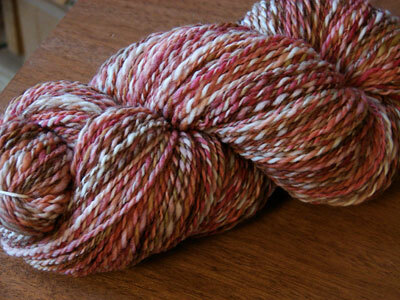 so pretty all spun up! 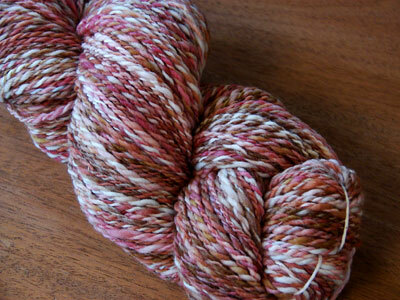 wow, love the new handspun! Like the half-melted dregs of a bowl of Neapolitan ice cream. I am thrilled that you are part of the PS fun. Beautiful handspun! Good for you, saving some of that homespun for yourself! I just received all of EZs books and can’t wait to read them. She is truly an inspiration. BTW, I just posted a couple FOs using 2 of your free patterns. They were a pleasure to knit and will be enjoyed by the recipients. The Opinionated Knitter is a favorite book, and the Baby Surprise Jacket is one of my favorite patterns (and I’ve found having a few on hand makes it easy to deal with those last-minute gifts for new moms!) It’s so much fun to see the genius of it (un)fold. Check out the Zimmermania blog (zimmermaniacs.blogspot.com) for some cool photos of them finished. Heck, join up if you start knitting one! Ooh I love that first one! If it were any chunkier, it would look like neopolitan ice cream. Great work! 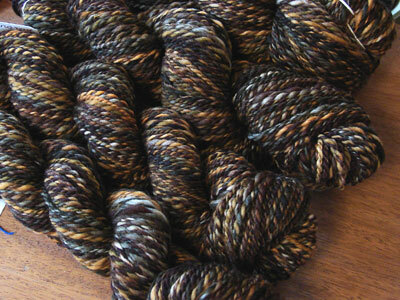 Oh… that is what I want my handspun to look like!! I wish I had time to spin- soon…….